I had a light-bulb moment this week. It was triggered by a panel I sat on at Sibos, hosted by the wonderful Adam Shapiro from Promontory Financial Group. My argument to the audience was the one I usually give: they should simply ignore the currency use-case: it’s the least interesting thing about Bitcoin. They should, instead, look at it as a platform for decentralized value-exchange and focus on the opportunities this enables. The panel discussion isn’t online but you can see us debate the issues on Sibos TV. I then returned to the warm embrace of the Innotribe room and thought little more of it. It is fair to say that Jeffrey is not a fan of cryptocurrencies. And he makes some well-aimed shots at the heart of the “Bitcoin is a useful currency” argument in the podcast. For example, he points out that vanishingly few retailers actually accept it, despite the hype (they, instead, receive dollars from BitPay or Coinbase instead). Now, one could take issue with Robinson’s arguments (he’s very confused on some technical aspects and the Boston Fed does see some evidence that consumers pay marginally less when using Bitcoin rather than payment cards). But surely this is to miss the point. Whether or not cryptocurrencies are superior than today’s currencies for today’s payment problems isn’t really interesting. It’s like saying that the automobile is a terrible way of pulling a plough. Cryptocurrency technology will succeed only to the extent that it enables new products and services that were previously impossible or unimaginable. And here’s the light-bulb moment: most of the really interesting use-cases turn out to need a payment mechanism – and having a currency and payment mechanism built into the platform turns out to be really, really useful. Causation runs in the opposite direction to what everybody seems to think: it is new products and services that will drive adoption of the underlying currency. Not the other way around. 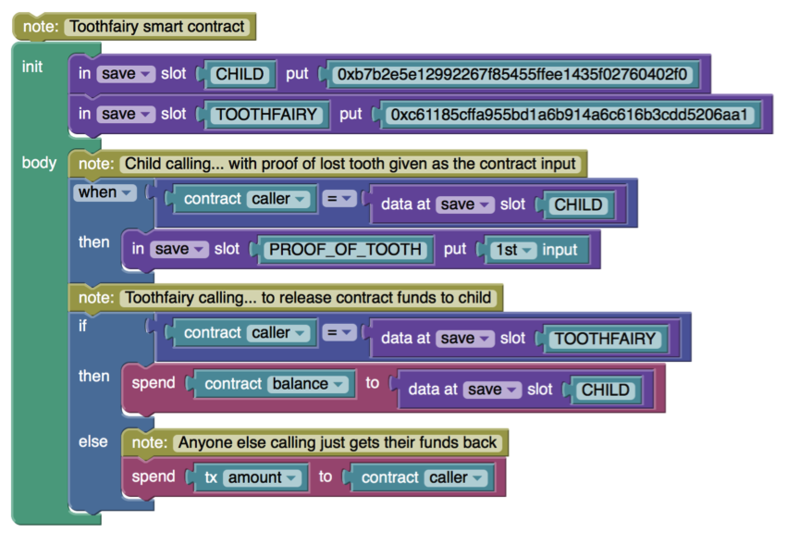 First, Chris Dixon offers some ideas for native Bitcoin apps. If I’m being critical, I thought they were somewhat pedestrian – they all seem to be answers to the question: “if Bitcoin the currency was widely deployed, what could you do with it?” – which I think is the wrong way to look at this. It has causation in the wrong direction. But Adam Ludwin at Chain.com also blogged on this topic. And his argument is more compelling to me. He acknowledged that we really can’t anticipate where this will go – but he highlights ideas like smart assets and so forth as promising areas of research. So can we flesh this out some more and identify additional examples? I hosted five startup CEOs on the Innotribe stage at Sibos on Monday and it’s interesting to me that the demo that created the most excitement was Yoni Assia’s demo of colored coins. He showed the (fake!) example of a large US bank issuing IBM stock on the blockchain so that it could be traded and transferred without the need for the plumbing we take for granted in the securities processing world. I think he used the CoinPrism platform. And it’s worth also checking out ChromaWallet. Using the Colored Coins concept to issue, track and transfer securities on a blockchain. I spoke to various attendees over the following days and this topic clearly excited them. The demo had helped them move from an intellectual, but shallow, understanding of the concept to one that helped them envision a future where custodians, clearing houses, exchanges and brokers work in a completely different way. 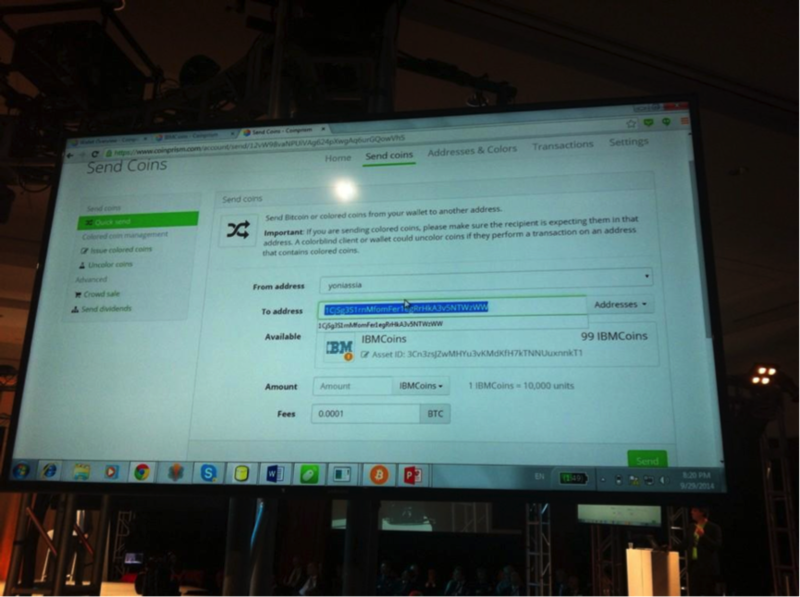 I’ve written about decentralized securities processing here and seeing it in a live demo made it real for people. Now the interesting thing is: this use-case has nothing to do with currency. The Bitcoins are just being used as a transport layer. All the intelligence and disruptive power is at higher layers of the stack. The key insight: what is the best payment mechanism for colored coins? But now… ask yourself a question: imagine this platform gained adoption. In what currency – and using what mechanism – would participants pay each other? Sure – you could use whatever you like. But the interesting thing is: if you paid in the native currency of the platform – Bitcoin in this case – some very special possibilities arise. For example, you can use the Bitcoin scripting system to make binding bids and offers without needing a central exchange. And you can achieve atomic swaps of currency for securities – delivery versus payment – without needing a custodian. So suddenly, a “currency” which may indeed have limited utility for today’s developed markets for today’s problems suddenly becomes utterly superior for this new use-case of decentralized asset exchange. What rules are needed to underpin this? Which legal precedents? But I think it’s examples such as this will lead us to a world of 1) unanticipatable products and services, for which 2) the optimum payment mechanism is the native token of the platform. To repeat: new apps will drive cryptocurrency usage… not the other way round. So what are some other potential use-cases? Indeed, one potential example of this has already been studied in Switzerland. A recent paper by Dominic Worner and Thomas von Bomhard examines “Exchanging Data for Cash with Bitcoin” – one could easily imagine “things” paying each other for access to trusted data feeds in other scenarios too. Vitalik Buterin’s presentation on Ethereum was a highlight of the first day at Innotribe this week. And I thought his host, Dan Marovitz, showed excellent judgement in allowing him to talk at length and in significant technical depth about his vision. The audience of senior bankers seemed to be completely rapt. At the core of the Ethereum concept is the idea that real-world relationships and contracts can often be reduced to deterministic rules that can be executed by a neutral, unimpeachable platform. And these contracts often (not always) involve the exchange of economic value, usually in the form of the native currency of the platform. Now… I have some reservations about Ethereum… it is so ambitious and so audacious that I worry that it might prove to be unbuildable – and I note that real-life isn’t always reducible to deterministic rules…. But, as Gavin Andresen has argued, it might be possible to achieve much of what Ethereum aims to do on top of the Bitcoin platform itself. At which point, the world of smart contracts would drive usage of Bitcoin-the-currency. It’s still early days, of course. But the lesson I learned this week was that we need to get away from the sterile “Bitcoin the currency” versus “Bitcoin the platform” debate. Instead, we should consider how one drives the other… and how it’s the platform that is likely to drive the currency, not the other way round. Great article as ever! Thanks Richard. great article. one thing to note is that if IBM’s ledger is on the blockchain, one no longer needs a reputation system. one only need to see that the stock issuing address is associated (there is a relationship between the controllers of those addresses who may be the same) with an address which contains btc profits of IBM, and/or an address which pays dividends for IBM. i think the most interesting use case is machine/cloud to machine/cloud payments for various resources. I’m ready for more details. How does the child give the proof? Are there not trusted human actors here to intermediate the messages between the nodes? I’ve long followed the idea of Ethereum but have to see more detail, despite the overall concept being so savoury. As soon as you need to inject trusted information into the system (market data, “proof of tooth”, whatever), you’re no longer perfectly decentralised, in which case it’s valid to ask: which pieces of the solution actually benefit from decentralised execution? Great post. Centralized value exchange has a lot of problems… The US Mint, for example, spends more to than $.01 to make a penny and more than $.05 to make a nickel. You can’t make this stuff up. Not producing physical currency has great benefits too but there have to be some downsides. I wonder what will happen to the most down-and-out, the truly destitute among us when physical currency dies completely. When a hungry, homeless, desperate person on a street corner can’t even ask for change (because nobody has any) to buy a hamburger, what will she do? How can a person who can’t come close to affording a device capable of using a digital currency ever hope to benefit or even pick up scraps? I recently wrote a silly little post urging everyone to throw their pennies on the ground because it’s an extremely efficient way to transfer utility. What happens when there are no more pennies? It is a great blog and I would like to thank you a lot for making us aware of such a precious information about the Cryptocurrency Development Services. Thanking you. Please keep on updating us more and more details and information. Cryptocurrency is also known as Unicorn for the generation or you can simply call it future money. many Ganesh Dhananjay Godse negative reviews might be there but still, he was the man with all positive energy and dynamic personality. Now a day’s Ganesh Godse is in a better position.